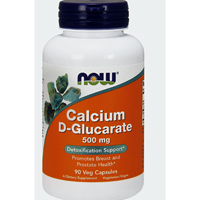 Calcium D-Glucarate is the calcium form of D-glucaric acid, a substance produced naturally in small amounts in the body. 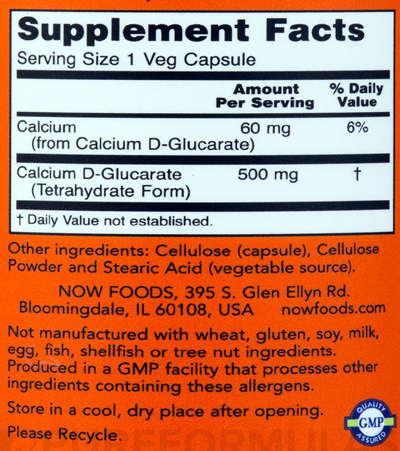 glucaric acid is also found in many fruits and vegetables. Scientific studies have found that Calcium D-Glucarate can facilitate complete detoxification and elimination of certain metabolic waste products and environmental compounds from the body. By supporting the body's natural cleansing mechanisms, Calcium D-Glucarate may help to maintain normal cellular function and promote liver, prostate, and breast health. Caution: For adults only. Do not take if you are pregnant/nursing. Consult physician if taking medication or have a medical condition. Keep out of reach of children.